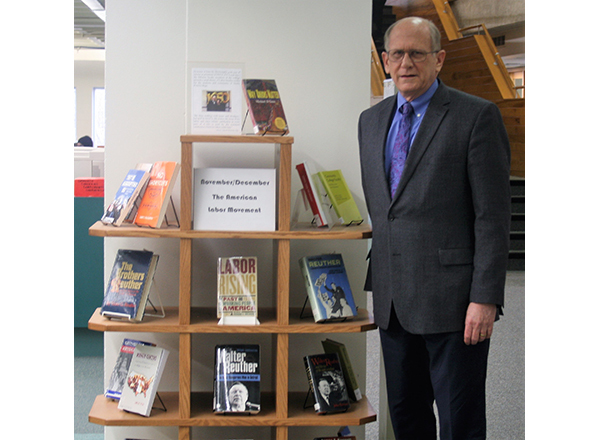 CAPTION: To celebrate John McDonald's 40th year as president of Local 1650, a collection in his honor called the Library of Labor Studies, chronicling the history of labor relations, has been established on the first floor of the Eshleman Library (Building B). 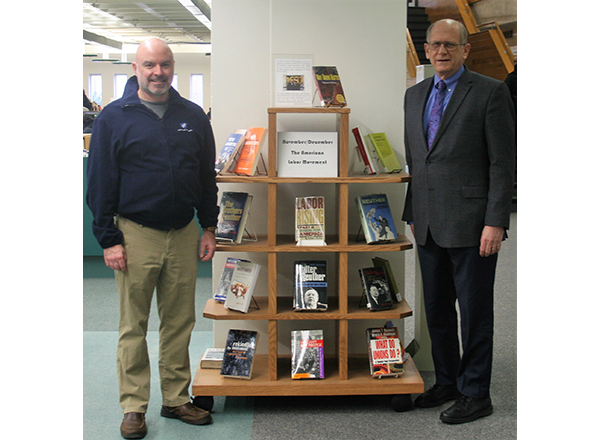 McDonald (right) is pictured with the Labor Studies collection and colleague Dr. Eric Rader (left), an HFC professor of political science. 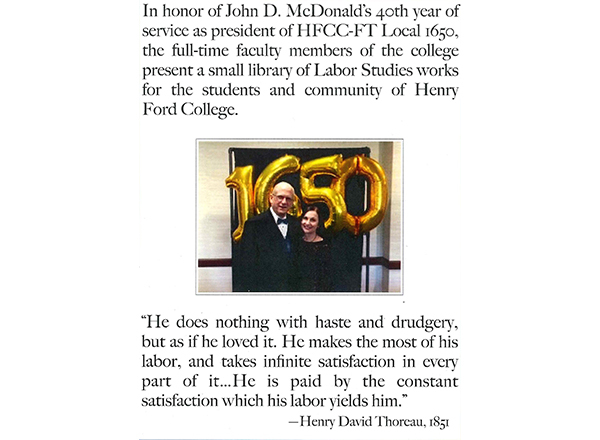 The HFC Federation of Teachers, Local 1650, wanted to celebrate John McDonald’s 40th year as president in a unique way. On the first floor of the Eshleman Library (Building B), Local 1650 officers created a section in McDonald's honor called the Library of Labor Studies. The collection chronicles the history of labor relations, particularly in Detroit. Dr. Michael Hill, HFC professor of English and one of Local 1650’s two vice presidents, planned the Labor Studies library in conjunction with fellow 1650 officers Dr. Eric Rader, vice president; Dr. Stacey Buchanan, treasurer; and Elaine Saneske, secretary. Not only does 2018 mark McDonald’s 40th year as president of 1650, he will celebrate 50 years at HFC in 2019. McDonald received his undergraduate and graduate degrees in English from the University of Michigan in Ann Arbor. His teaching career at HFC began in 1969, focusing on English composition and 19th-century American literature. Since 1978, McDonald has been the president of Local 1650. He has also served as the American Federation of Teachers-Michigan’s vice president for higher education since 1978, as well as a member of the AFT Higher Education Program and Policy Council since its inception in 1991. In 2012, he was the first elected vice president of the AFT at the national level, which represents 1.7 million members. In mid-2018, he was re-elected to the position. Under McDonald’s leadership, 1650 has negotiated one of the strongest community college contracts in the United States with respect to shared governance, community service, wages, post tenure review, distance education, intellectual property, and professional development. McDonald has fostered within Local 1650 a strong tradition of political activism and community engagement. McDonald also played a major role in the formation of the Adjunct Faculty Organization, AFT Local 337, at HFC. As a member of the HFC English Department, McDonald has served on curriculum, accreditation self-study, strategic planning, and facilities planning committees throughout his career. He has co-chaired the advocacy campaigns for nearly 20 operational and capital improvement ballot proposals. McDonald became involved in Local 1650 in 1971 shortly after he received tenure. Declining enrollment throughout the district resulted in layoffs at the P-12 level, and the superintendent – who oversaw both P-12 and the College at that time – mandated layoffs that McDonald believed were unnecessary. McDonald was among nine College instructors who were laid off. At the time, McDonald says, Local 1650 and the Michigan Federation of Teachers did not intervene. On behalf of his colleagues, McDonald hired Donald Calkins, a Wayne State University law professor. Calkins filed a lawsuit against the Dearborn district and the College. In the end, McDonald's and his colleagues’ employment at HFC was restored. McDonald was not fully compensated for his lost earnings. Rader lauded McDonald on the impact of his leadership. The College congratulates John McDonald on his 50 years of College and community service, and 40 years of union leadership. Stop by the Eshleman Library to see the Library of Labor Studies collection, and to check out the collection's books. Faculty and staff, as well as students, have borrowing privileges at the library. John McDonald with the Library of Labor Studies in the Eshleman Library. The explanatory sign at the Library of Labor Studies, which celebrates John McDonald's 40 years as president of Local 1650. In the photo, he's pictured with his wife, Denise.